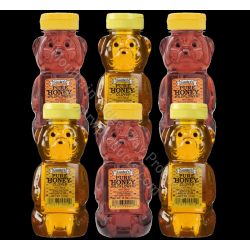 A great way to have your children (Over 1 year of age) enjoy the natural sweetness of honey with their own Honey Bears! With this 6 pack you can enjoy Three Bears of the lighter tasting Gunter's Clover Honey and Three Bears of the darker Gunter's Wildflower Honey. Each bear is 12 oz net wt.